The Charts view gives you powerful statistical analyses of bed, theatre and clinic usage and waiting list movements on different days of the week. So you can quickly see the causes of capacity problems, where there may be opportunities to improve performance, and where you could increase the capacity allocated to each service. whether at any time the system was out of control and performance was unusual. This is useful because, if performance is worse than you wanted, you can tell whether something unusual went wrong (in which case you can go and investigate the root causes of that event), or whether this is just part of the usual range of performance you should expect from the system (in which case there is no point in investigating the root cause of that event – you need to improve the system if you want to improve performance). You may also see these referred to respectively as “special cause” and “common cause” variation. The first row of charts (the histograms) shows how common it is to see each number of admissions per day. You can see that from Monday to Friday, non-elective admissions are fairly stable at about 120 per day with a range of variation from about 60 to about 150 admissions per day. At weekends there are fewer admissions – more like 80 per day on average. Three blue-green lines are superimposed on each control chart to show the usual behaviour of the system: the middle line is the mean (average), and the outer lines are called the upper and lower control limits. 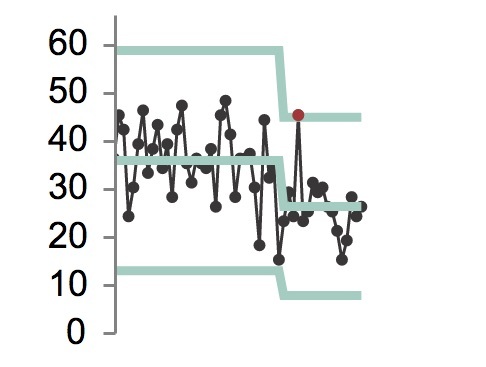 Some of the points on the control chart are picked out in red, to show where performance was so unusual that you would not expect to see it happening by chance in a stable and predictable system. For instance, any point falling outside the upper or lower control limits is red, and so is a long run of points on the same side of the mean. Those are just two of the rules – there are eight in total, and the ones we have used are called the Nelson Rules, and they are designed to pick out special causes of variation. You can see unusually low red points where there was a bank holiday (on a Monday), and at Christmas (which fell on a Friday – when you are in Gooroo Planner, you can hover the mouse over any point to get a tooltip showing the date). If you have taken management action in real life to change how the system behaves, then you will want to see whether your action was successful. You can do this by splitting the chart on the date the change was made. For instance, here are the same charts, but with a split in the middle. You can see from the blue-green lines that the system performance was somewhat different after the split, particularly the last two charts showing the weekend. Most of the points that were red in the previous charts have gone black, now that the behaviour of the system over different time periods has been taken into account. Further charts for this data (which I won’t include here) show that non-elective discharges also fall at weekends. But crucially, they fall even more than admissions do. So the beds tend to fill up with non-electives at the weekend, and are fullest on a Monday morning which is just when elective inpatients are wanting to come in for their operations. Other charts show that weekend patients are more likely to be admitted to the wrong ward, and have a longer and more variable length of stay. So the conclusion from this example data is that, if the hospital could discharge more patients over the weekend, then that would solve a lot of problems. This is similar to findings in a published study of another hospital, where improving weekend discharges was projected to improve performance against the A&E target. Other view: activity per day, additions to the waiting list per day. a time of day chart (not shown above) showing how performance varies by time of day (e.g. whether beds tend to fill up in the morning and empty in the afternoon). Filters are available for all chart selections, allowing you to choose the historical time period to study, and which services to include (down to any level of detail that you have included in the patient-level data files, including down to consultant level). Because every chart requires a lot of analysis, and there are so many charts on each page, it does take a few minutes to display each page of charts. I wish it were quicker, but there we are. The depth and power of the analysis should make it all worth waiting for. These fields are documented in the Gooroo Planner documentation. As always, if you don’t have certain data available, then don’t worry because you can still obtain analyses from the data that you do have. And we are always on hand to help you if you get stuck. Great news that you have included SPC charts in your software. My experience over 15 years of teaching them is that I really have to get across the point about the 2 types of variation first before people see the point of using them. Otherwise they become just another display option and a matter of personal choice. I haven’t seen your User Guide but I hope it starts the SPC section with a discussion about common and special causes and the consequences of reacting to the wrong one.